If you decided that it is time for a change when it comes to your hair look, balayage is the most suitable technique for you, as it certainly offers a nice and cool refresh. It is wonderful for people who aim for a fashionable look and who also want to feel great about their appearance. As this technique gained a lot of popularity among the celebrities especially in last year, from Jessica Biel, Jennifer Lopez or Rihanna, everyone is lately asking for balayage, as they wish to achieve the amazing ‘just been kissed by the sun’ hair look. Balayage is a French technique and it means “to sweep”, it consists in a softer and natural transition of the colors as they are applied by hand and no foil or meche is used, this is why it is also considered to be a freehand technique. Such as an artist, the colorist carefully chooses the areas of your hair where the color needs to be applied so that it will perfectly match with your hair-cut, skin, and features, resulting in a natural, effortless blended look. Focusing on the idea that “less is more”, it uses strips of light and shade in order to create depth and dimension to the color and also to the hair. Don’t be scared, you will not get drastic changes in your hair, but for sure you will get a modern and stylish hair look! This technique is for everyone, you can rock the look whether you have dark, red or blonde hair, whether is straight, wavy or curly the color will still work well and look great. It works wonderfully on a hair below the shoulders as well on a short pixie cut, everyone can use this technique, having the possibility to achieve different effects from soft, romantic, natural look to something more strong and punky, depending on the intensity of the highlights and on the style that the client wants to achieve. Balayage is perfect for people who don’t have time to go every couple of weeks to the salon for a touch-up, so a major advantage would be low maintenance. The second advantage would be that you can get a balayage quite rapidly as it takes about 30-45 minutes for half-head and about 30 minutes up to an hour for a full head. 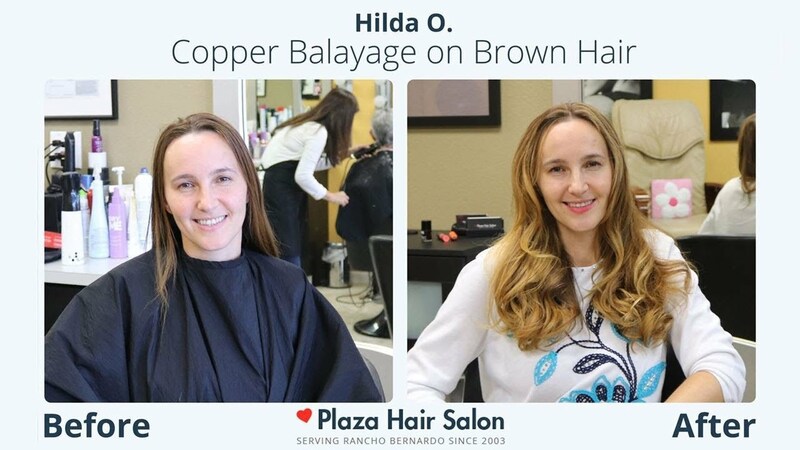 So, if you want to give a restart to your hair you should go for a Balayage coloring technique with our trained staff at Plaza Hair Salon. Allow our professional hairdressers to create a custom color just for you and your type of hair! In order to reach the best result, we will gladly listen to your wishes, our color experts will also give you suggestions based on your features and we are more than sure that together we will pull the best look for you. Pay us a visit to Plaza Hair Salon and get this procedure. Call 858.485.7551 or e-mail us at appointment@plazahairsalon.com for your appointment. Walk-ins are always welcome too!